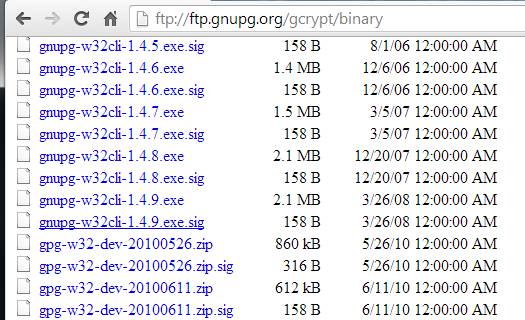 The Gnu Privacy Guard is a software package that generates keys and encrypts data. Scroll down and find the latest Windows version--when I wrote this, it was gupg-w32cli-1.4.9.exe, as shown below. Download the EXE file. Install the software with the default options. You could use an existing email account for this project, but I recommend that you create a new one if you are working in S214 to prevent other students stealing your password. Also, I don't think student Gmail accounts from CCSF will work. To do that, go to gmail.com and click the "Create an account" button. Fill out the form to create an account. IMAP is Internet Message Access Protocol, and we will use it to connect Thunderbird to Gmail. You should be logged in to Gmail. 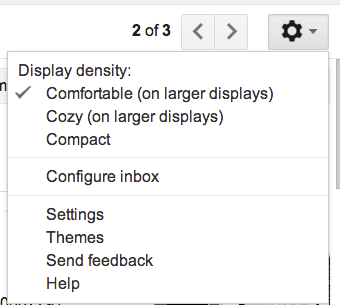 On the upper right, click the gear icon, and then click Settings. 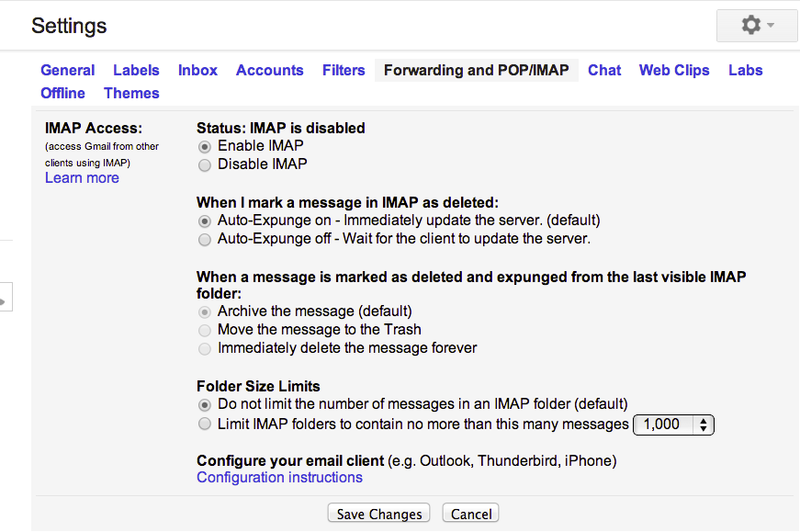 On the Settings page, click "Forwarding and POP/IMAP". In the "IMAP Access" section, click "Enable IMAP", as shown below. Click the big green "Free Download" button. Download the software and install it with the default options. 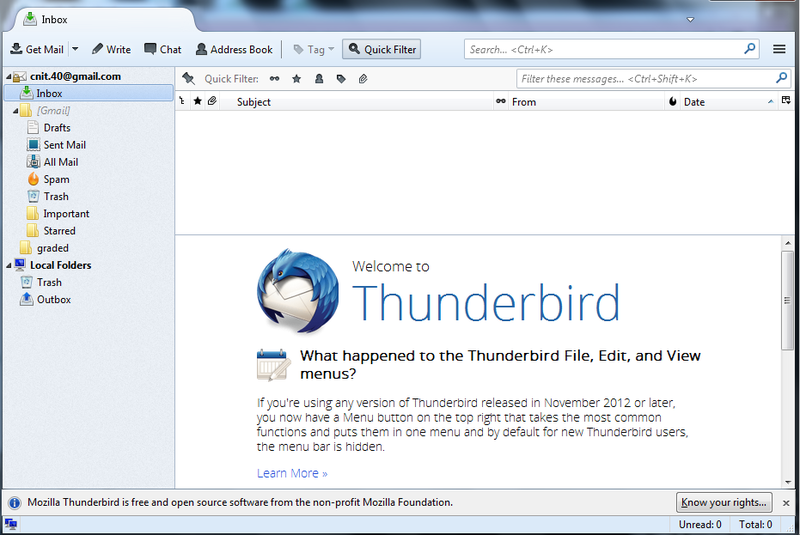 After installation, Thunderbird launches automatically. In the "System Integration" box, click the "Skip Integration" button. The next box offers to create a new email address, but they will want money for it, so, on the lower left, click the "Skip this and use my existing email" button. 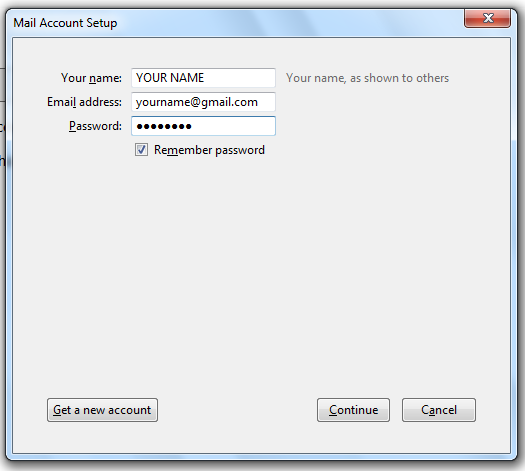 In the "Mail Account Setup" box, enter the requested information, as shown below, and click Continue. Note: if you are using a real email account on a public computer, don't check the "Remember password" box. Thunderbird should automatically configure your Incoming and Outgoing email servers, as shown below. If Thunderbird shows this message: "Configuration could not be verified - is the username or password wrong? ", check your password. 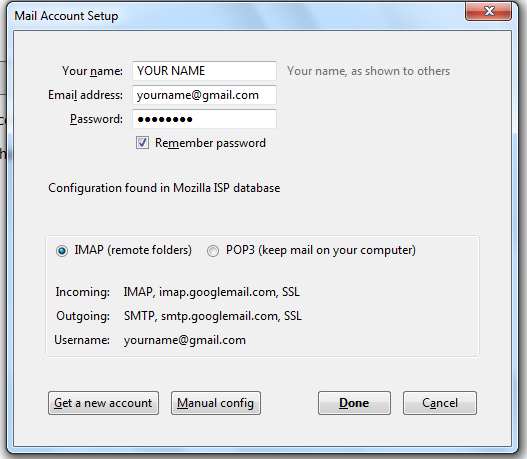 If it's correct, check to make sure IMAP is enabled in Gmail. 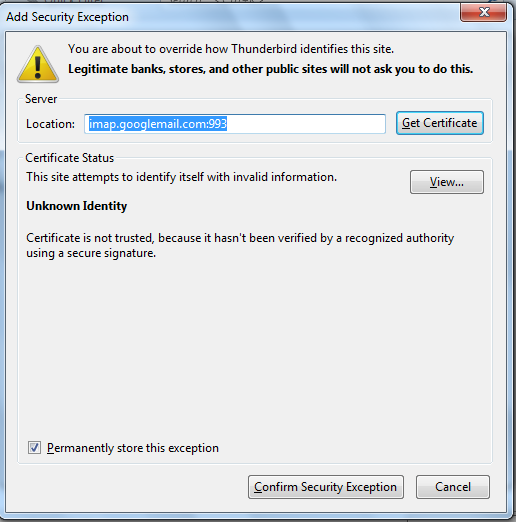 A warning pops up saying that the IMAP server has an untrusted certificate, as shown below. I'm not sure what that means, but click "Confirm Security Exception" anyway. 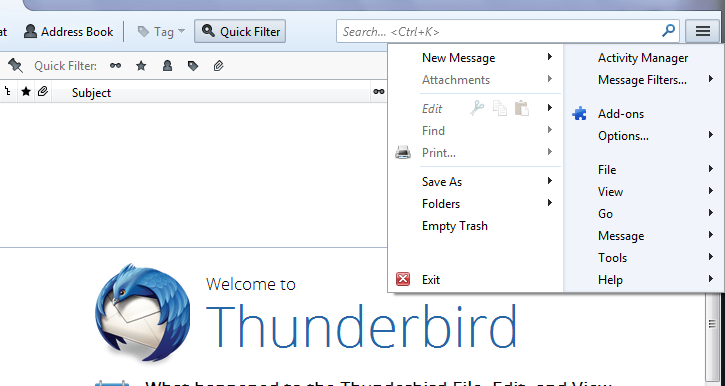 You should now see your inbox in the left pane of Thunderbird, as shown below. Enigmail is a Thunderbird add-on that allows you to use Gnu PG to encrypt your email. In the Add-ons box, at the upper right, in the "Search all add-ons" box, type enigmail and press Enter. In the "Enigmail" row, click the Install button. A message appears saying "Enigmail will be installed after you restart Thunderbird". In Thunderbird, close the "Add-ons Manager" tab, to make the "Inbox" tab visible. In the "Welcome to the OpenPGP Setup Wizard" box, accept the default selection of "Yes, I would like the wizard to get me started" and click Next. In the "Signing" box, accept the default selection of "Yes, I want to sign all of my email" and click Next. In the "Encryption" box, accept the default selection of "No, I will create per-recipient rules for those that sent me their public key" and click Next. In the "Preferences" box, accept the default selection of "Yes" and click Next. In the "No OpenPGP Key Found" box, click "I want to create a new key pair for signing and encrypting my email" and click Next. In the "Create Key" box, enter a password in both boxes. If you don't plan to really use this encryption, use something simple like "password". Otherwise use a long passphrase. In the "Summary" box, click Next. An "OpenPGP Confirm" box pops up, asking whether to create a revocation certificate. Click the "Generate Certificate" button. A box pops up asking where to save it. Accept the default location and click Save. Type in your passphrase when prompted. An alert box appears, saying "The revocation certificate has been successfully created". Click OK. In the "Thank you" box, click Finish. No one can send you encrypted email unless you put your public key on a server where people can find it. 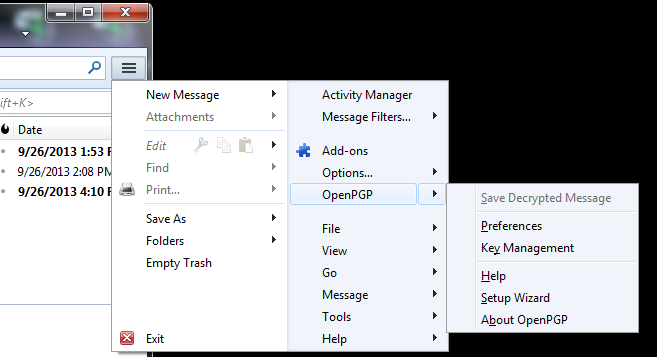 In the "OpenPGP Key Management" window, type your email address into the search box. Your key should appear in the lower pane, with a Key ID, as shown below. 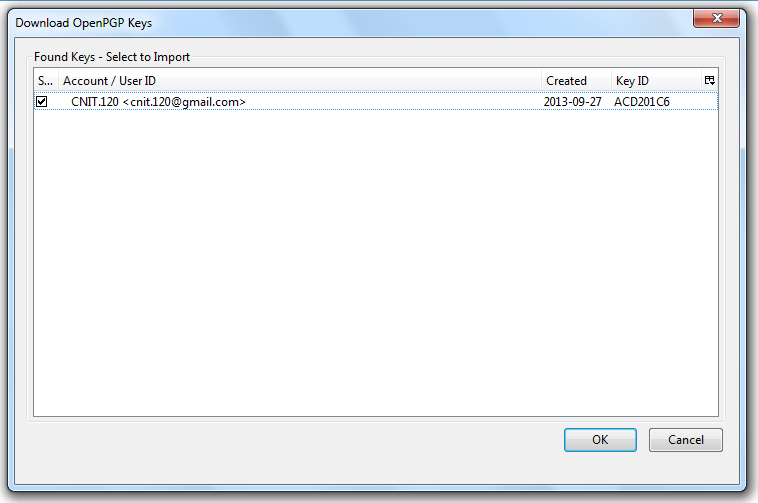 Right-click your key ID and click "Upload Public Keys to Keyserver". In the "Select Keyserver" box, click OK. In the "OpenPGP Key Management" window, click Keyserver, "Search for Keys". In the "Select Keyserver" box, type cnit.120@gmail.com and click OK.
A "Download OpenPGP Keys" box pops up, with the CNIT.120 key checked, as shown below. Close the "OpenPGP Key Management" box. In Thunderbird, at the top left, click the Write button. Compose an email to cnit.120@gmail.com. Send a Cc: to yourself, at the gmail account you are using for this project. 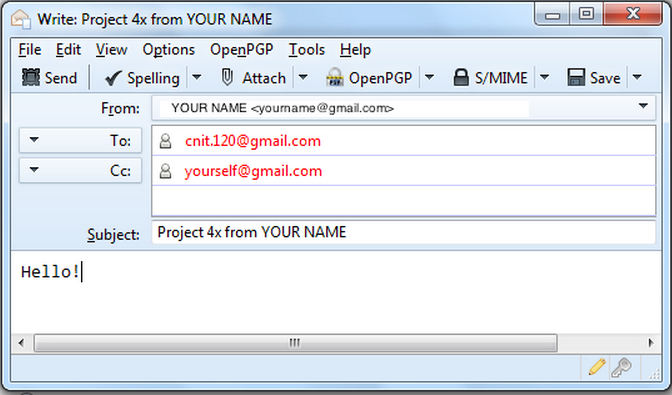 Enter a Subject of "Project 4x from YOUR NAME", replacing YOUR NAME with your own name. In the Write window, from the menu bar, click OpenPGP, "Encrypt message". In the upper left of the "Write" window, click Send. Type in your passphrase when prompted to. Open a Web browser. Log in to the Gmail account you are using for this project. Look at the copy you sent yourself of the message you sent. It should be unreadable ciphertext, as shown below. 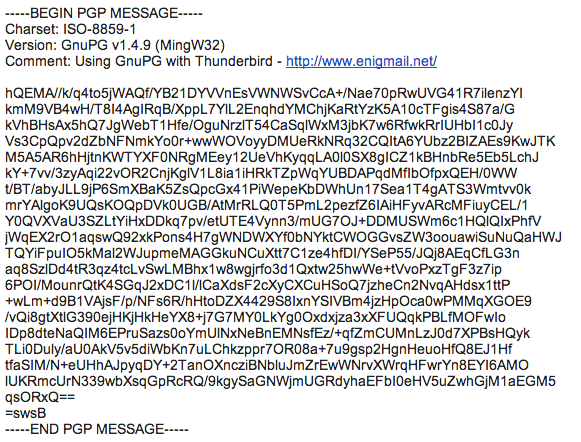 To decode the message, you need to use Thunderbird, not Web-based email, because Google doesn't have your private key. You're done--we will grade the project based on that email. You don't need to send in any images.